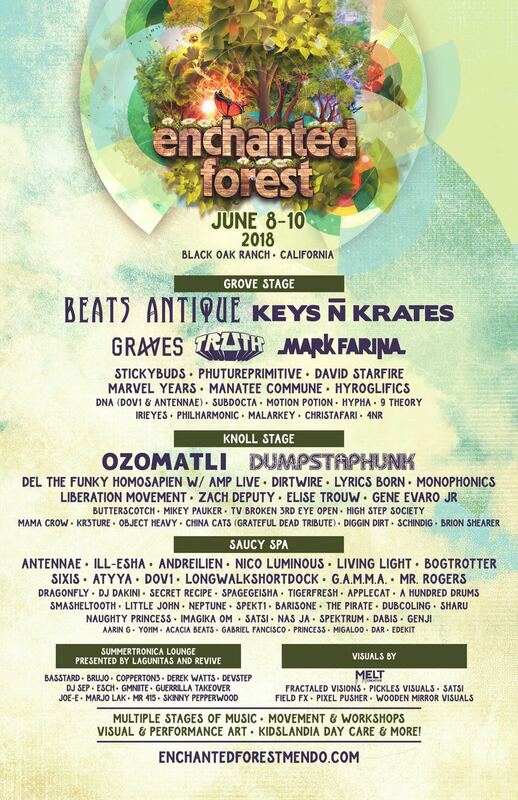 Enchanted Forest Gathering returns to Black Oak Ranch in Laytonville, California on June 8th - 10th, 2018. Welcome back Enchanted Forest Family! We are very excited to announce your new favorite weekend at Black Oak Ranch in Laytonville, California: June 8-10th. Our exotic, custom stages will be brought alive all night long with a truly Enchanted music lineup. We have a limited capacity so definitely don't sleep on tickets. Believe us when we say, "You won’t want to miss the magic we have in store for you." Follow Us! Stay Connected! We are hilarious! Relax into beautiful natural splendor in one of the most amazing festival sites in North America. For over thirty years Black Oak Ranch has been hosting events that speak to the heart and inspire healing and joy. In the heart of Redwood country find your temporary home away from home amidst a beautiful oak woodland. Grass, shade, giant oak trees and a beautiful stream sets Enchanted Forest Gathering apart from the rest. Our Ease & Grace Prepared Camping options allow you to arrive at an insightfully arranged space while camping in a blissful habitat of meadows and woodlands bordering Ten Mile Creek. Stay tuned! Enchanted Forest Gathering features a variety of Yoga Classes from world renowned teachers and local instructors and is INCLUDED in your festival ticket. Our dance floors have already hit legendary status. It's been statistically proven. Our music lineup will have you moving and grooving all weekend! Included in your ticket are dance classes and our mini 'Flow Arts Festival' for your supreme movement pleasure. We are proud to be a multi-generational, world-bridging event that is beyond family friendly. We take generous care to be fully family supportive and have an incredible Kidslandia your kids will love and daycare options for families. There is, but we aren't telling. Thanks for reading this far though! We are keeping some things a secret, as we feel there just aren't enough surprises these days. All Ticket Tiers are available in a limited quantity. Once the allotment of the given Ticket Tier is sold out, tickets will continue to be sold at the next Ticket Tier, while supplies last. Once you purchase, you will receive an order confirmation email from See Tickets on behalf of Enchanted Forest Gathering 2018. Your e-ticket(s) will be attached to your order confirmation email as a PDF. Make sure to print them out and bring them to the event; or go green and have them on your phone! IMPORTANT: If you do not see your order confirmation in your inbox, make sure to check your junk/spam folder. If you still do not see your order confirmation in your inbox, click here to access See Tickets support. If you are having any other technical ticketing-related issues with your order, click here to contact See Tickets. For general festival info, click here. All sales final. No refunds or exchanges. If you find you are unable to attend after purchasing your ticket, you may transfer it. A valid photo ID (passport, state issued license, or military ID card) matching the name on the ticket must be presented at the gate for entry. For information on transferring your tickets click here. All children under the age of 18 must have their own Youth or Child admission ticket and be accompanied by a ticket-holding parent or legal guardian. Event is rain or shine. Are you offering payment plan options? Yes our payment plans via Affirm are available, you can select it as your method of purchase and there are a few time frames to choose from for you to pay for your ticket within. Yes. All 3-day weekend tickets include tent camping. If you'd like to camp with your car, you'll need to purchase a Car Camping Pass in addition to your festival pass. Car Camping and RV Camping Passes are limited! No, each adult will need a 3-day weekend pass to receive their wristband and enter the festival, however you'll only need one car pass per vehicle. Our squad wants to come on Thursday, does each person in our group need to get an early arrival pass or do we only need one per vehicle? Each person in your group must purchase the Shwirly Arrival Pass to arrive on Thursday. Tickets can be purchased at the gate if they are still available at showtime. Is yoga included or do we need to purchase a separate pass? Yoga and all workshops are included in your festival ticket. What are the gate hours for this event? Gates for general admission open Friday, June 8th at 9 AM. The event ends Monday, June 11th and we ask that you leave Black Oak Ranch by noon on Monday. We’re here for you! Email info@enchantedforestmendo.com for assistance with purchasing a ticket.